These Pet Rescue level 76 cheats and tips will help you beat level 76 of Pet Rescue. 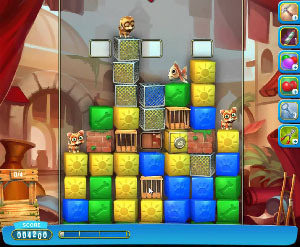 The objective of Pet Rescue level 76 is to save 4 pets and score 50,000 points. The worst thing that can happen on this level is you allow a pet to get trapped by a cage, because that renders the pet worthless if it hits the ground and it is best if you don’t have to waste a rocket to save it. Keep a barrier of blocks between your pets and the cages and you won’t run into this issue. An easy way to do this is to keep the caged blocks intact and simply make matches beneath them. Columns can get too high all too easily on Level 76, and with only 4 pets on the board and a minimum of 4 pets to be saved, you can’t have any pets fall off the board or you will lose the level. Don’t worry about columns that don’t have any pets in them because it doesn’t matter if blocks fall off. The balloons are a great help on this level, but they are most useful if you save them until the available matches on the board run out and you need them as a last resort to keep things moving. Make matches as normal, and when the board seems to slow down, that is the time to use a balloon.